I had promised in the comments of my last posting that I would respond to some questions and comments. I had this lonnnggg post all planned where I was going to give several scenarios about holding two positions (at least one being an elected one) and the ramifications from that. It’s long overdue, ironically due to my working two jobs; a paying one and a volunteer role managing my husband’s campaign. When does it become unethical to be a party's representative\candidate and a municipal politician at the same time? Or is that just if you're a party's leader -- not a lowly candidate in a riding, say? Rhys hits on a key distinction relevant to the Glenn Taylor situation. He has been “elected” to two positions. If he had been a part-time plumber and elected leader of the Alberta Party, likely no one would have cared other than maybe his plumbing customers. As it is he is paid by the taxpayers of Hinton. Will they know or care if his attention is elsewhere? Are they okay with paying him when he might actually be doing work the Party at the time? More to Rhys’ point though; he is asking at what level of candidacy and at what point does it become unethical. I’ve done some digging and there are indeed a few people who sit on town councils and have been elected as candidates for provincial political parties. I think we need to examine what the expectations are for those candidates to fulfill their roles. Some may not anticipate doing anything until an election is actually called. Others may do some campaigning on evenings and weekends. If it is the latter; I think they would have to be very cautious of making a crystal clear distinction between their elected duties and their candidacy efforts. For example; if they attend a meeting as a councilor and are selling memberships to their respective party… then yes, that’s out of bounds in my opinion. To be very open about this, past Alberta Party leaders have held or kept their other jobs and its never been an issue. Partly because their jobs weren’t elected positions. But more importantly there were none of the huge expectations of the current incarnation of the party. If the members are happy with a part-time leader then so be it. If they had expected a leader who can do the summer BBQ circuit, fundraising, attend CA formation meetings, attend caucus meetings and much, much more… well then they will be very disappointed. As fate would have it; Glenn Taylor today provided us with an example of how his two roles conflict. This picture was posted on Twitter today along with this comment. 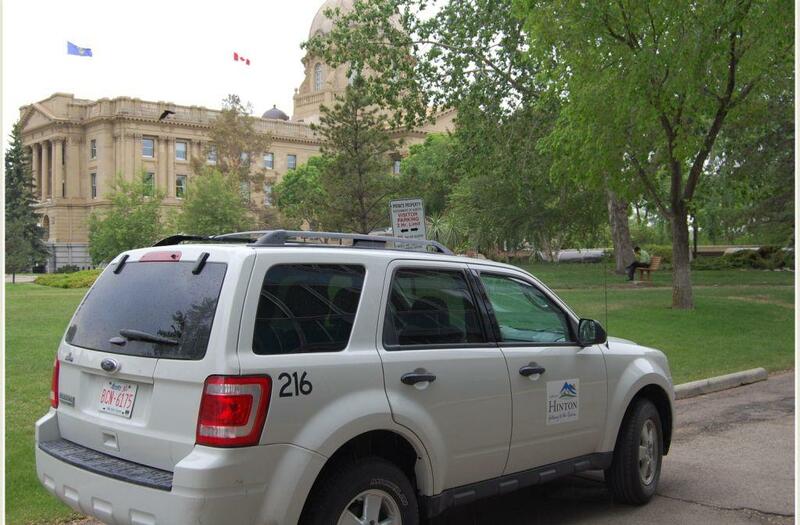 @NDPview: #abparty ldr Taylor uses Town of Hinton vehicle to visit MLA Taylor at #ableg all afternoon. Naughty ldr. Apparently Glenn Taylor went to the Alberta Legislature today to meet with Dave Taylor. It seems quite obvious he drove a vehicle belonging to the town of Hinton. Now is this a vehicle for his own personal use? Is it shared with other members of council? Hmmm and there "all afternoon"? I wonder who is going to pick up the cost of the parking ticket? Seems Mr. Taylor is creating more questions than he is answering.